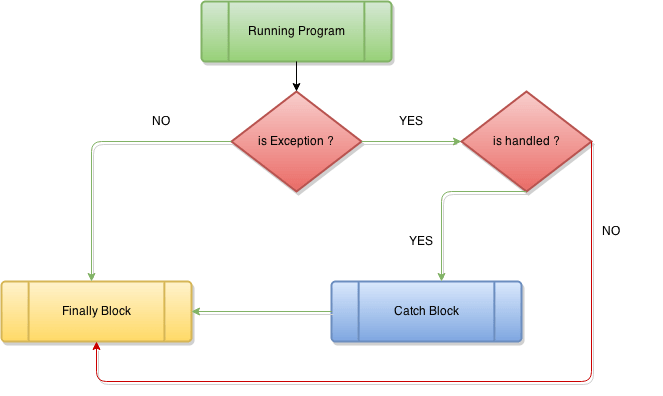 Home Web Development How does Exception Handling work in C#? Exception handling is a built-in mechanism in .NET frameworks to detect and handle run-time errors. The .NET frameworks contain many standard exceptions. The exceptions are anomalies that occur during the execution of the program or in another aspect at the time of running the program. They can be because of user, logic or system errors. If a user (programmer) does not provide a mechanism to handle these anomalies, the .NET runtime environment provides a default mechanism that terminates the program execution. Exception: An Exception is an error that arrises at the time of program execution. Exceptions do not occur at the time of compile time, it always occurs at runtime and user does not know in advance that what can be the exception. A number of Exception occurred due to programmer logic errors or system errors. Like, divide by zero occurs an AirthmaticException. 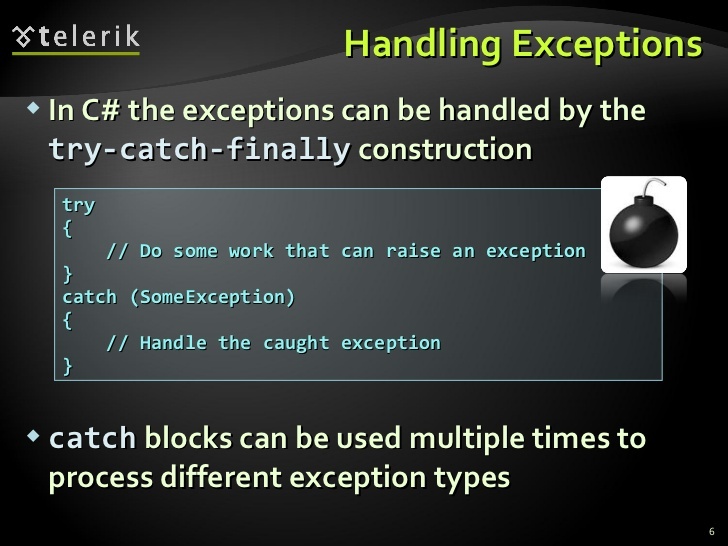 C# provides four keywords for exception handling: try, catch, finally and throw. Try: try block contains the code in which the exception can occur. The programmers write their own code, logic inside the try block to handle the different exception. One try block followed by many catch block. 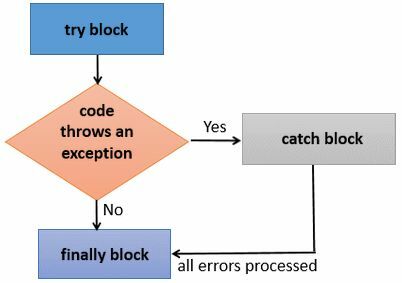 Catch(): Catch block is used to catch the exception which occurs in the try block. At one time only one catch block executes. Finally: ‘Finally’ always executes weather exception is thrown or not in the program, it’s always executed. throw: throw keyword is used to throw an exception in the program. C# provides the three keywords try to catch and finally to do exception handling. The try block encloses the statements that might throw an exception whereas catch handles an exception if one exists. The finally block always executes in the program. the statement which can cause an exception. statements for handling the exception. If any exceptions occur inside the try block then the control transfers to the appropriate catch blocks or a finally block or with both catch and finally block. If there is no exception occurs inside the try block then the control transfers to the finally block. We can say that the statements inside the final block are executed always. Note that it is an error to transfer control out of a finally block by using the break, continue, return or goto statement. In c#, exceptions are nothing but runtime Exceptions. The Exceptions is the ultimate base class for any Exception in the c#. The c# provides many of runtime exceptions like as Arithmetic exception, indexOutOfBound exception, Stack Empty Exception etc. In c# the programmers can create their own Exception classes, functions etc, this should inherit from either the Exceptions classes or one of the standard derived classes of the Exception, class like DivideByZeroException or ArgumentException and so on. Exception for overflow and stack empty Exceptions in a class is created for stack Data Structure: Stack Over Flow Exception is thrown for execution stack overflow errors, typically in case of a very deep or unbounded recursion. Stack Overflow Exception uses the FOFO policy to handle upcoming data, it stands for First in First out. C# provides a list of values for an instance of StackOverFlowException, set the StackOverFlowException.#ctor constructors. public sealed class StackOverFlowException: SystemException. // that will illustrate the StackOverFlowException. the exception will be thrown inside the function call but will keep traversing up the stack until we catch it inside main. Stack Empty Exception: Stack Empty Exception is the compile-time exception, it is not a runtime exception. This exception simply follows the FIFO policy(First in First out). In this post, I have described the Exception (Run time and Compile time exception). 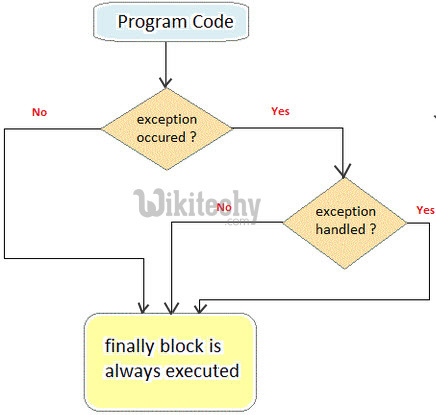 An Exception is an unwanted error that occurs at the time of program execution. 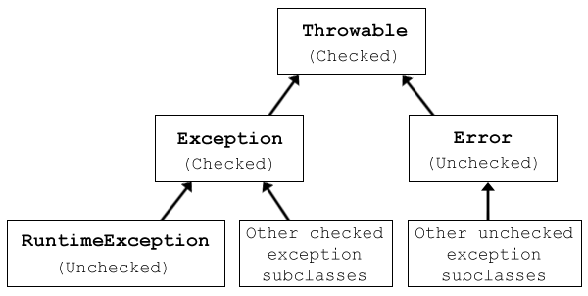 Exceptions do not occur at compile time, they always occur at runtime and the user does not know in advance that what exception can be there in the program. Moreover, I have described how Exceptions handle in the C#. Also, I have explained about different exceptions that occur at the time of the program execution. Exceptions like Arithmetic Exception, stack empty exception, etc. We can catch multiple exceptions for the same try block. I have clearly shown how a programmer throws an exception and handle an exception. I hope this blog is valuable and beneficial for the learner. Thank you! Previous articleWhy iOS is Much Better than Android? Next articleHow To Request HTTP headers with .Net using c#?